The T-Scan is a force measurement tool and a diagnostics tool leveraged at the dental office of Dr. Gorbatov in Hollywood, FL. This tool helps record bite force and enables Dr. Gorbatov to do so with greater accuracy when compared to manual articulating paper marks. Dr. Gorbatov uses it in a variety of ways to benefit patients. 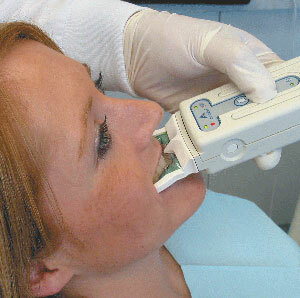 The T-Scan can be used in a variety of areas, including basic dentistry procedures as well as periodontal treatment, in orthodontic treatment, with TMJ disorder treatment, in determining tooth pain sources, in preparing customized dental appliances in removable prosthetic dentistry, in implant dentistry, and more. It offers software with patient files and 3D and 2D images for dentist and laboratory use as well as for patient education. 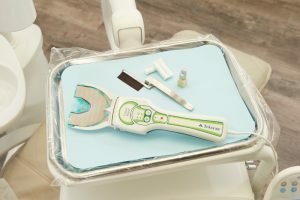 The T-Scan eliminates guesswork and improves accuracy for a comfortable and more aligned bite. It can help you and your dentist avoid additional appointments to make adjustments due to a large amount of room for error with articulating paper marks alone. It records timing as well as force. The T-scan analyzes your bite and measures pressure. It provides your dentist with important information that can be used in the treatment and in the creation of dental appliances to fix bite issues. Biting down on an ultra-thin sensor provides all the data required. Dental technology is an important consideration when choosing a dentist. Hollywood, FL dentists who leverage the latest in technology do so to help you, the patient, benefit from the latest in dental advances with minimally invasive procedures for a better experience at every dental appointment. Today’s dental diagnostics tools provide a plethora of benefits for more accuracy. Dr. Gorbatov works in a number of practice areas that leverage this technology, including general and preventative dentistry, cosmetic dentistry, neuromuscular dentistry, and restorative dentistry areas.